Within this screen (shown below) you can add all TLDs you wish to sell from the current list offered by Netistrar. This list along with the prices you currently pay Netistrar on your active pricing tier can be found here. To allow customer orders to be automatically sent to Netistrar ensure that for each TLD the Auto Registration column select box is set to Netistrar. This is the most usual way to provide fully automated sales through WHMCS. To enable a customer to activate the Netistrar free Privacy Proxy service for a given TLD please ensure that the ID Protection checkbox is ticked. 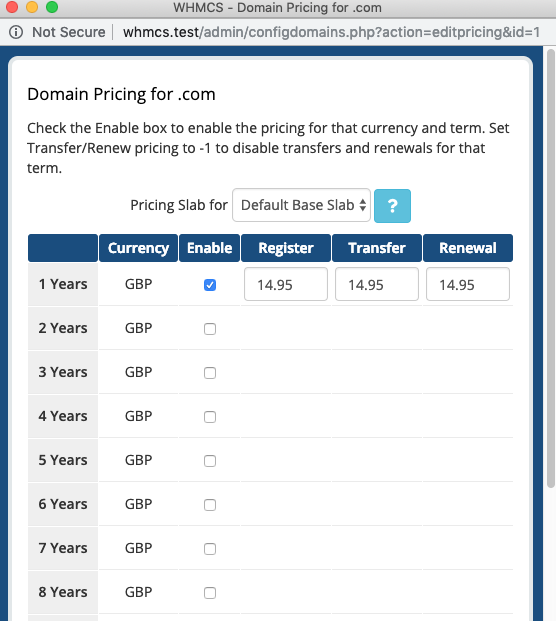 To support transfer in operations for all TLDs except for Nominet .UK, .CO.UK, .ORG.UK and .ME.UK please ensure that the EPP Code checkbox is ticked. Currently we do not support DNS Management or Email Forwarding features although these items are on our roadmap for development. Spotlight TLDs are used by WHMCS as promoted TLDs when users search for domain names. These should generally be set to those TLDs which you wish to promote on your site. Please refer to the pricing for your Netistrar tier here to provide a basis for your retail selling prices. WHMCS provides built in basic support for checking availability of domain names which is enabled by default when WHMCS is installed. To enhance the experience, Registrar modules can provide their own alternative Lookup Provider which will be used instead of the default one. We are currently providing an Experimental alternative Lookup Provider which uses the same availability and suggestions engine as used to power our own site searches here. This utilises Name Spinning technology using Namestudio API developed by Verisign. As this is an experimental feature, we value your feedback on the usability / usefulness of this feature as part of the Registrar Module. You will notice that the currently active provider is highlighted. Please click Select under the Domain Registrar option and Choose Netistrar as the provider. This will activate the Netistrar experimental lookup provider for use when searching for domains by your users.